One of the defining features of the Russian Library is its generic diversity. This is particularly significant for an Anglophone audience, because we tend to think of the Russian literary tradition as one that derives its greatness from novels, primarily the 19th century masterpieces of Tolstoy and Dostoevsky. Others think first of Chekhov’s fin-de-siècle plays, which have become part of the Western canon in large part because of their connection to Stanislavsky and eventually to method acting. Russians, and for that matter, scholars of Russian, are more likely to consider poetry the best and most powerful iteration of Russian letters. The first three books in the Russian Library will publish in December, and while the three have much in common—linguistic virtuosity being the most obvious example—they amply demonstrate the profusion of genres that make up Russian literature. Before going any farther, let me digress momentarily to admit that I am and will be referring to genre in a fairly unsophisticated manner. I believe that it is generally more productive to think of a work as exhibiting certain generic characteristics, rather than belonging to a genre. However, obeying the generic conventions of the blog post, I’m not going to get too hung up on it here. While the subject matter is undeniably grim, The Hurdy-Gurdy andFourteen Little Red Huts are remarkable for their humor, both a slapstick, physical humor (especially in the first title) that recalls Beckett and a linguistic humor, founded on the disconnect between lofty Soviet slogans and wretched everyday conditions. This latter form proves very productive in art throughout the Soviet period, even when the suffering of the people becomes less acute. You can see it, for instance, in the late Soviet period in the sots-art movement in the visual arts and the poetry of the Moscow conceptualists. It is also a technique used in the next of our inaugural Russian Library titles. Stalin, who once wrote “Scum” in the margin of one of Platonov’s works, died in 1953, and a brief period of relative liberalization followed, commonly referred to as the Khrushchev Thaw. The Sinyavsky-Daniel trial, which took place in 1966, is seen as one of the markers of the end of the Thaw. (Brezhnev took power in 1964.) Andrei Sinyavsky and Yulii Daniel were accused and convicted of publishing material abroad that undermined the reputation of the Soviet Union. The trial itself hearkened back to the show trials of the Stalin era, and significantly, fiction by the defendants was used as evidence of their guilt, which was unprecedented. The outcry in the West was acute. Sinyavsky served six years in the gulag, and during this time, he wrote Strolls with Pushkin in letters to his wife. Given how integral the quotations from Pushkin are to the text, this is remarkable, as is, indeed, the text as a whole. Sinyavsky published Strolls under his pseudonym Abram Tertz, which is one clue that the book is not a straightforward work of literary criticism. Tertz is a maverick, even an outlaw (the pseudonym is borrowed from Abrashka Tertz, a Jewish bandit from an Odessa thieves’ song). Sinyavsky himself called it a work of “fantastic literary scholarship,” a kind of analog to the “fantastic realism” whose publication abroad had caused him such trouble. Sinyavsky ignores not only the arguments of Soviet scholars who positioned Pushkin as a kind of proto-communist but any outside evidence at all, insisting on taking the poet seriously on his own terms. But this is not some kind of latter-day New Criticism, where nothing outside of the poem matters, or an attempt to declare the death of the author (though death, for Pushkin, will come soon enough). Sinyavsky’s declared goal is to get at the essence of what makes Pushkin so great, and facts of biography, poetry, and politics are only helpful insofar as they support him in this goal. For instance, one of the hallmarks of Pushkin’s verse is its effervescent effortlessness. Evidence that Pushkin labored over drafts, used by some scholars to show that Pushkin was not in fact an aristocratic flibberdigibet, but rather a something of a shock-worker, and by others to show that he was a serious and deep thinker, gets in the way of Sinyavsky’s narrative, so he refuses to believe it, manuscript evidence be damned. 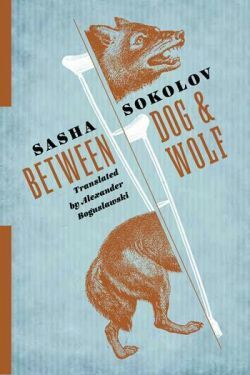 The final inaugural Russian Library title, Between Dog and Wolf by Sasha Sokolov, seems at first glance like a straightforward novel, if one with an unreliable, and not particularly literate, narrator. But as the instability of the narrative line becomes more apparent, even generic boundaries start to break down. Whole chapters, for instance, consist of nothing but poetry. Like Platonov and Sinyavsky, Sasha Sokolov was profoundly affected, and restricted, by Soviet reality. Sokolov was born in 1943 in Canada, where his father was attached to the Soviet embassy, but he grew up in Moscow. He had some success in both unofficial and official literary circles, but was briefly jailed after an unsuccessful attempt to flee the Soviet Union over the Iranian border. His father’s connections saved him from having to serve a long sentence, and he went to work as a gamekeeper in the Tver region. It was here that he wrote A School for Fools, which would become his most famous novel, and gathered the impressions that would so influenceBetween Dog and Wolf. Sokolov was finally given permission to emigrate in 1975, after his then wife, the Austrian Johanna Steindl staged a hunger strike. He lived briefly in Austria before settling in the States, and has lived in North America ever since. I hope this brief introduction to the three inaugural Russian Library titles has demonstrated the wide range of Russian literature that the series will publish. The 19th century novels are great, and world literature would look very different without them (see, for instance,last week’s Thursday Fiction Corner for an example Dostoevsky’s influence). But Russian literature has even more to offer.